London, UK. 12th November 2018. 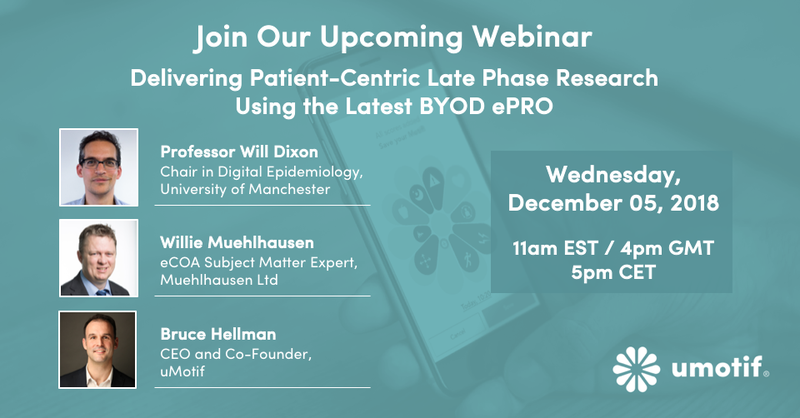 Bruce Hellman, uMotif CEO joins leading epidemiologist Professor Will Dixon and eCOA expert Willie Muehlhausen on Wednesday 5th December for a 60-min webinar. They will be sharing their insights on how to take advantage of new trends in BYOD technology for ePRO, sharing industry case studies including data from the 13,500 participant, direct-to-patient, 'Cloudy with a Chance of Pain' study and will be discussing the benefits of a patient-centric approach to clinical research for all stakeholders, leading to greater patient engagement, more data capture and faster study times. Join us for the live webinar to find out more.